The blessed drink of early morning is the Tea. But, Having Tea is your most loved mug is satisfaction. I am a kind of a person who adores innovative stuff. Recently, my favourite mug broke down and I was disheartened. So, I start surfing on internet in search of mugs with amazing and extra ordinary design. While surfing I can across handicrafts by Kala Drishti. I was extremely stunned to see such imaginative items and outlines. They have assortment of items which are utilized as a part of our everyday life, for example, statues , mugs and so forth. I came across a lot of mugs printed with great designs and scenery. 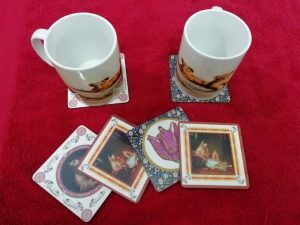 I selected two mugs of same design with six coasters. One for me and another for my tea partner , my mother. 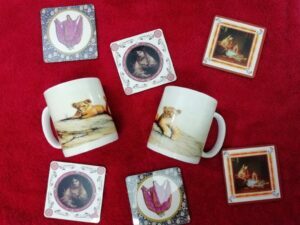 The mugs I selected has two lions sitting in an open ground while signifies freedom , bravery and power. I relate this to me and my mom. Being women , we feel we are not less than anyone. And the mug gives us more inspiration. Kala Drishti handcrafts , not only build great products but also inculcate hidden messages. The mugs has a good grip and are light in weight. Also, the coasters are really pretty, full of colors. They too signify moral messages. The mugs are spacious. They one who loves to have tea in great quantity can enjoy their tea well. The mugs are made up of hard material. So, there is hardly any chance of cracks. Kala Drishti handicrafts have a wide variety of products. You must visit them once and select your favourite product. You can purchase the products online too on the online portals especially snapdeal.